If you have been a follower of our blog for a while you know we love Educational Insights award-winning learning toys and hands-on educational materials. We received the 2-in-1 microscope with base and removable scope. Note: The Tuff Scope does require 3AA batteries which are not included. perfect for home and/or school use. - but you need a sunny day to really see through the scope this way! We set out on a cloudy day (FL rainy season) and couldn't see much. We are looking forward to trying this again on a nice sunny day. 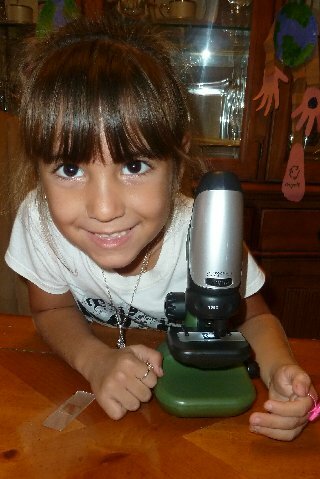 Overall, the Lil Divas really enjoyed their experience with the Geo Safari Tuff Scope. The Littlest Diva especially kept searching for things to study all over the house. this is definitely a tool we will make use of to help incorporate some fun science into our lessons at home. 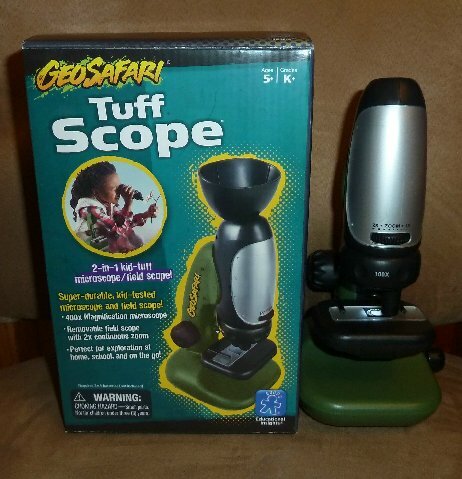 I am so excited that the kind people at Educational Insights will be giving the Geo Safari Tuff Scope to one lucky Mom to 2 Posh Lil Divas follower! I just know you will love it and get creative doing some fun hands-on science explorations with it! Buy It: Purchase the Geo Safari Tuff Scope at Educational Insights website. 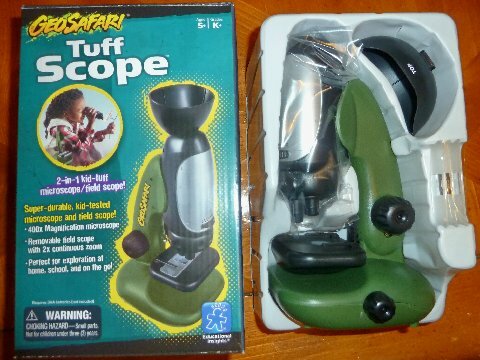 Disclaimer:I received the Geo Safari Tuff Scope for the purposes of trying them out for this review. That being said, this review is my 100% honest opinion of this product - I am not paid for my reviews or optinions! They are 100% mine! Please remember that your opinions and tastes might differ from mine. I have moved to a new classroom for my 12th year teaching kindergarten. The larger space allowed me to set up an area dedicated to science. I plan to have the children work more independently as they explore this wonderful world. Having a scope would be a game changer! my son would LOVE this. i think he would enjoy looking at any sort of bug. My 2 girls would love this! We'd use it for exploring our garden a little more closely! This looks great. I would love to explore bugs more closely. Not sure if the girls would though. They may prefer some flowers or leaves. We have a small piece of skin from the black throated monitor in our zoo's petting yard. The zookeeper knows we homeschool and gave it to us when the monitor was shedding so we could use it in our studies. It would be great to get a view of it with this. I especially like that this is "tuff"! also posted a comment on your Rainbow Fish activity! My girls would love to magnify their fingernails. I'd love to look at some bugs! Commented on this week's Wordless Wednesday. 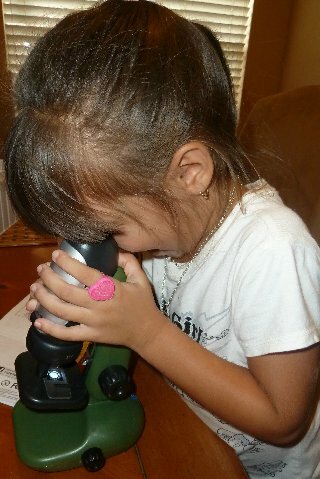 my son loves finding bugs and flowers outside, it would be cool to look at them under the tuff scope!! Would like to magnify sand. I think it would be cool to magnify a butterfly's wing. Might not be so cool for the butterfly though. Or how about a dollar bill. That would be cool too. I would like to take a look at my makeup...wonder what it looks like huge. The kids love exploring anything "nasty", so maybe swabbing the bathroom items. 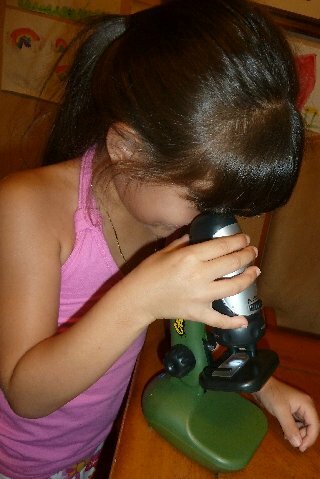 They also love bugs, so examining a wing (of a fly) or leg of a critter. An ant...my 16 month old loves them! We would love to magnify some pond water. Bugs, butterflies, moths, etc. My kids are "bug kids" & would love to check them out closer! I'd love to look at a strand of my hair. 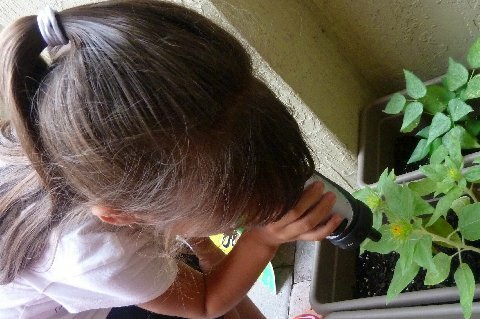 I know it's not that creative but I know my daughter will want to look at every bug that she can find! I would like to look at ice and snowflakes! I commented on the Water Fun: Ice Painting post! My 4 kids would love to look at food up close.Thanks! I follow on GFC #1.Thanks! I follow on GFC #2.Thanks! i like educational insights on Fb as Leslie Luke Stanziani.Thanks! I follow on twitter as lstanziani #1.Thanks! i follow on twitter as lstanziani #2.Thanks!